Students will be able to identify rhyming words. They will also be able to conduct basic comparisons of different types of media. Ask the students to raise their hands if they have read or listened to the book Green Eggs and HamBy Dr. Seuss. Explain to students they will be listening and watching the story again, but with an added challenge. 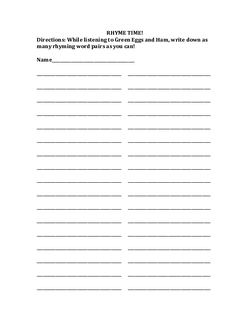 Pass out the Rhyme Time worksheet and read the directions aloud to the class. Read aloud Green Eggs and HamTo the class and encourage them to write down as many rhyming words as possible on their worksheets. After reading, ask students to volunteer rhyming words they wrote down while the other students cross off the rhyming pairs if they have them written on their document. Continue until everyone's rhyming words have been crossed off. Play Green Eggs and HamVideo. 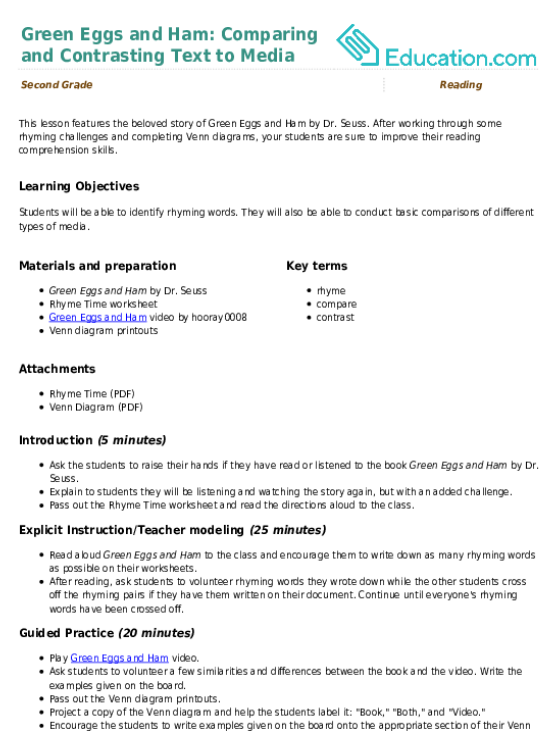 Ask students to volunteer a few similarities and differences between the book and the video. Write the examples given on the board. Pass out the Venn diagram printouts. Project a copy of the Venn diagram and help the students label it: "Book," "Both," and "Video." Encourage the students to write examples given on the board onto the appropriate section of their Venn diagrams. Allow students time to continue to fill out the Venn diagram until they have at least five items written in each section. Allow five minutes of time for students to work with a partner to write additional information onto their Venn diagrams. Enrichment:Challenge above level students to write their own rhyme or short story using the words they wrote on their Rhyme Time worksheets. Support:Allow students who need support to write 3-4 items in each section of their Venn diagrams instead of 5. Use the graded Rhyme Time worksheets and Venn diagrams as informal assessment tools. Ask volunteers to share items they wrote on the Venn diagrams with the class. 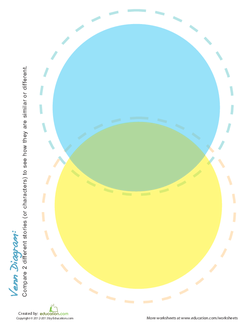 Allow other students to add information to their own Venn diagrams.